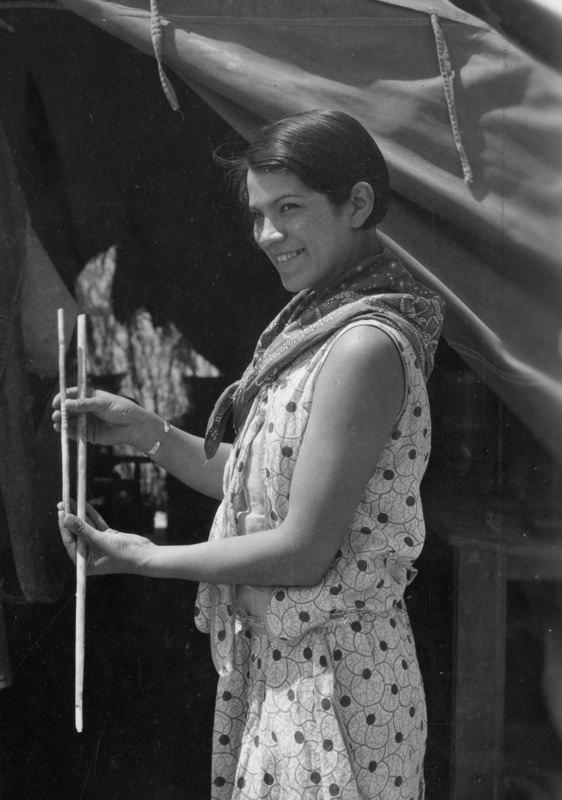 Bertha Parker Pallan #NativeAmericanHeritageMonth « Adafruit Industries – Makers, hackers, artists, designers and engineers! Bertha “Birdie” Cody (nee Parker) is widely considered to be the first Native American female archaeologist. Despite not having had the benefit of formal training or a university education, she demonstrated tremendous skill and insight, made a number of high profile discoveries, published innumerable articles and became a well-respected spokesperson on Native American culture. Of Abenaki and Seneca descent, Bertha was born in 1907 in Chautauqua County in upstate New York. Her father, Arthur Parker, was an archaeologist and the first president of the Society for American Archaeology. When her parents divorced in 1914, Bertha moved to Los Angeles with her Mother, Beulha Tahamont, and her maternal grandparents, all three of whom were actors. Bertha herself was involved in show business as a teenager, performing in the Ringling Brothers Barnum & Bailey Circus in a Pocahontas show alongside her mother. During the early 1920s, Bertha married Joseph Pallan and in 1925, the couple had a daughter, Wilma Mae, whom they nicknamed ‘Billie’. Bertha’s archaeological career began around 1927 after her marriage to Pallan came to an end. She started working with Mark Raymond Harrington, her uncle by marriage, who had hired her to be the cook and expedition secretary on his archaeological projects. She was involved in excavations at various locations and learned first-hand about archaeological procedures in the field. In 1929, Bertha was taking part in excavations at Mesa House and discovered a pueblo site which she named Scorpion Hill. She excavated the site herself, documenting and photographing her find. She would later publish the results of her work and discoveries at Scorpion Hill and the pieces were exhibited in the Southwest Museum. In 1930, Bertha was working with Harrington at Gypsum Cave in the Nevada desert. It was an important site as it showed evidence of the first human occupation of North America during the geological era known as the Pleistocene. As expedition secretary, it was her job to maintain and catalogue the finds. However, Bertha was also responsible for the discovery of another site nearby when she spotted a fossilised camel bone jutting out from the bed of an eroding lake. Whilst on this expedition, Bertha explored the various chambers of the Gypsum Cave in her own time. Being of a slim build with slender hands, she was able to access some of the hard to reach crevices. Thus she discovered some ancient human tools and, more importantly, the skull from a species of extinct giant ground sloth. Harrington described this as the most notable find of the expedition because it garnered funding and the support of institutions such as the California Institute of Technology and the Carnegie Institution of Washington. It also enabled Harrington to hire a young Canadian palaeontologist called James Thurston to work on the project. In 1931, Bertha married James Thurston but he died following a sudden illness only a year later. Following his death Bertha herself suffered with a protracted illness and moved back to Los Angeles. She was employed by the Southwest Museum, initially as an administrator but later as an archaeologist and ethnologist. Throughout the next four decades Bertha published a large number of archaeological and ethnological papers in Masterkey, Southwest Museum’s journal. She wrote on subjects such as Kachina Dolls, the carved humanlike forms, usually with a spiritual significance, which are particularly associated with Pueblo Native Americans, and California Native American baby cradles. She also wrote several articles on the Yurok Tribe, Native Americans who lived in Northwest California near the Klamath River and Pacific Coast.